INAA is a method to determine the concentration of trace (1 to 100 ppm), minor (0.1 w/o to 1.0 w/o), and major (1.0 w/o and above) elements in a variety of matrices. Samples are exposed to neutrons, producing radioactive nuclides in the sample (neutron activation). 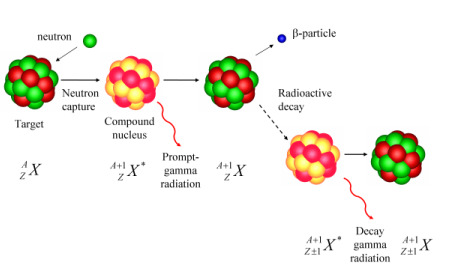 When radioactive atoms in the sample decay, gamma rays with characteristic energies are emitted by each nuclide. Using a gamma-ray spectroscopy system (GRSS), the quantity and energy of emitted gamma rays can be measured. The energy of the measured gamma rays can be used to “fingerprint” the radioactive nuclides, and therefore the elements that were activated. In addition, the concentration of these elements can be determined quantitatively by comparison of gamma ray intensities with those emitted by standards for the various nuclides. This sensitive analytical technique is useful for a variety of purposes, including geological, environmental, industrial, and forensic. At the NRL, the neutrons are supplied by the OSURR, for which irradiations can be scheduled and tailored to meet individual researcher requirements. Samples should be supplied ready for analysis in small sealed polyethylene vials, and while the NRL has a limited selection of standards materials, the researcher may need to provide standards (samples with known concentrations of the elements of interest). In some cases, the irradiations are performed using the pneumatic transport system, which uses air flow to deliver samples to a position adjacent to the core. After a pre-determined irradiation time (typically on the order of minutes), the system automatically returns the sample to a shielded holding box. In others, the samples will be placed within the CIF vertical dry tube and irradiated within the core for an hour or more. This table provides approximate detection limits for several elements. Actual detection limits depend on major components of the material. The NRL can provide NAA services in support of research and development. Researchers interested in neutron activation analysis services at the NRL should fill out this form with the requested information. We will reply by e-mail after we have reviewed your request.